In many cases the therapist will need to see and assess the affected part of the body and surrounding joints, so having suitable underwear on is advisable especially if you have a spinal problem. For Endermologie you will need a special suit, which you can buy here (20euro). Do I need a doctors refferal to receive treatment? You don’t need to have a refferal to be seen at the practice, clients are welcome to contact us directly for an appointment. For those clients who are referred to us by a GP / Specialist / consultant, our policy is to provide your referring practitioner with regular updates as to how your therapist is progressing, and how it is impacting your injury / rehab, and any new developments which may arise in the process. We can normally offer same day appointments for acute or emergency cases - please phone first thing in the morning to check availability for that day. For less urgent cases, you may need to wait a day or two; we will always do what we can to see you as soon as possible. 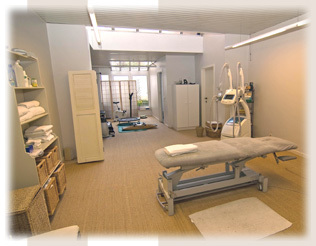 We are qualified to treat all areas of the body. They are essentially movement specialists, therefore able to treat spinal problems, muscular and ligamentous injuries, fractures, post-operative surgery and also assess and correct postural problems at workstations. Note: this list is not complete, there are a lot of pathologies that we can treat. Don’t hestitate to contact me when you have any questions. We consider each person as an individual. At your first visit, a detaild case history will be taken.This will involve your current symptoms as well as questions concerning your general health an previous medical history.Then using palpation, points of strain,weakness or poor function may be identified. The treatment may consist of massage of soft tissues,joint articulation and manipulation techniques. With added excersises,posture en health advice, we will help you to reduce the symptoms and improve your health.